REVIEW SUMMARY: The continuing adventures of Captain Uriel Ventris and the fourth chapter of the Ultramarines. BRIEF SYNOPSIS: Exiles of the Ultramarines Uriel Ventris and Pasanius find themselves back in the worlds of the Imperium, and thrown into one battle after another. PROS: Lots of unapologetic and graphic action; interesting story lines; well-drawn principle characters who sometimes make mistakes; the final book gave the whole series an epic feel. CONS: Pacing was slow in places; secondary characters unmemorable; excessive use of superlatives was distracting. BOTTOM LINE: Leans heavily on some of the other WH40K stories (especially by the same author), but nonetheless enjoyable on its own and, truth be told, makes me want to go read those other stories to fill in the cracks. The Second Ultramarines Omnibus (a continuation of the story that began in The Ultramarines Omnibus, reviewed here) collects together books four through six of Graham McNeill’s series about the adventurous exploits of the devout fourth chapter of the Ultramarines and its captain, Uriel Ventris. Rounding out the omnibus is an Ultramarines short story (“Eye of Vengeance”, a fast moving story about the mission of an Ultramarines scout) and the pages of a 2004 graphic novel story starring Ventris that actually takes place before Book 1. When last we left Uriel Ventris and his friend Pasanius, they were exiled to the Chaos world of Medrengard were they were sent to complete a Death Oath as atonement for their Heresy against the great teachings of their founder, Roboute Guilliman, in their previous quests. They were not expected to return but — spoiler alert that’s not really a surprise — they survived, albeit not unharmed in various physical and psychological ways. In the introduction to The Second Ultramarines Omnibus, the author admits that the first trilogy, having been written early in his writing career, more or less contained no long term plan for the characters. Despite that confession, the first trilogy did leave readers with a sense of progress and character advancement. For this second trilogy of books, McNeill laid out a longer arc laid out for the heroes and for the whole Ultramarines company. Indeed, as the stories progress, not only do we get to see Ventris’ attempts to find his way back into the loving arms of his beloved Fourth chapter, but we also see the culmination of lots of groundwork — not just set forth in the previous omnibus, but also in McNeill’s related Iron Warrior stories. The second trilogy begins with The Killing Ground, which sees Ventris and Pasanius being unceremoniously dumped onto an unknown world (and fortunately one not in the demonic warp) by the demon train that took them away. Accompanying them to the planet are a band of the “unfleshed”, the childlike, genetically-altered victims of macabre experimentations on Medrengard. The city into which they arrive is deserted and clearly the location of an unfathomably disastrous attack. What they soon learn is that the city — Khaturian, also known as “The Killing Ground” — was the site of a horrific act of war. The event weighs heavily on many of the people of Salinas, to the point that they begin to see ghosts of the victims. As the luck of an Ultramarine would have it, things begin going badly quite quickly. 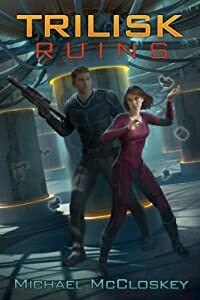 Uriel and Pasanius, discovered in the forbidden city by Colonel Verena Kain of the planet’s military forces, are thought to be part of an ongoing rebellion led by the “Sons of Salinas” and their charismatic leader. While their allegiance to the Imperial ways are under question, a new threat (tied to the Ufleshed) also emerges from the Warp. Uriel thus has to contend with proving his loyal intentions, a local skirmish between the planet’s government and a band of rebels, and a horde of evil enemies trying to establish a foothold between the Warp (where evil lives) and an Imperial world. All of this proves to be great fodder for some excellent storytelling and world building, which by now I have come to expect from Warhammer 40K books. The neat thing here is that the Ultramarines are not considered de facto good guys. The planet’s leader, Leto Barbaden (the tyrannical ruler who resides in the egotistically-named city of Barbadus) doesn’t trust them straightaway, so Uriel has to prove himself. Between rebel attacks and Warp-transformed monsters, he’s got plenty of opportunity. Even so, by the third act, new characters are introduced to ramp up the action even more. My only issue with The Killing Ground is that it’s not immediately clear who we are supposed to be rooting for regarding the rebellion sub-plot. Salinas is under the control of an Imperial regiment that has, by Imperial right, “earned” the planet by conquest as a reward for years of service to the Emperor. Imperial law or not, this makes the leaders seem like invaders who confiscated the planet from its citizens. (There’s some hand waving about Salinas being “caught up” in the liberation of planets in that system from the forces of Chaos, but it seems like an unfair power grab.) To be fair, Barbaden is an unlikable jerk from the get-go and Uriel immediately recognizes him as such, but in a setting where Imperial law is what the heroes are shooting for, this seems like a broken system. Or perhaps that’s the point, to show that good and bad aren’t always black and white. The second book in the trilogy, Courage and Honour, puts Uriel and Pasanius back on Pavonis, the location of the action in the first book in the series (Nightbringer). But this novel does not quite match the action level of The Killing Ground, at least not at first. During the relatively slow start, aliens known as the Tau are discovered on Pavonis and Uriel attempts to convince the planet’s new leaders that they should mobilize their military forces. However, in an attempt to rebuild the planet after the attacks detailed in Nightbringer, several trade pacts are in the process of being established, and a heightened military presence could jeopardize those pending agreements and hurt the planet economically. That makes for a relatively slow first-half while the wheels of politics turned and the stage was set for what was to follow. What followed in the second half of the book, however, is almost non-stop action. This is the meat-and-potatoes Warhammer 40k fans might expect. There’s certainly no shortage of personal melees, raids, large scale battles, and scenes of brutal war once the action commences. One stumbling point for this reader (one who is not well versed in the lingo of Warhammer gaming) is the frequent references to the large variety of weapons and vehicles — Devilfish, Hammerheads, Baneblades, Sky Rays, Stingwings and the like — whose role could not necessarily always be determined from context. I have to imagine a WH40K RPG player would not have that problem. Part of that confusion, however, was due to my second quibble with Courage and Honour: there were a large number of factions and separate story threads. On the one hand, this is something to be enjoyed; it adds a welcome complexity to something that might otherwise be a too-linear plot. On the other hand, there was often confusion about which character was with which unit. In Courage and Honour, there are the Ultramarines, of course, but also the Lavrentian Hussars (a Pavonis-based Imperial force meant to help rebuild the planet), the local PDF (Planetary Defense Force), the planetary government leaders, the clergy, and the alien tau. When one of the myriad, interleaved story threads picked up, oftentimes with characters from different factions, I had to remind myself which group some of them were with. As a result, there was little emotional connection with most of the characters in the book outside of the principle players. A list of the main characters, preferably grouped by faction, would have been super helpful. One of the undercurrents of the story is Uriel’s redemption. This mission is meant to be his re-initiation as Captain of the chapter after his heresy. (Apparently, completing his Death Oath was insufficient. Boy, those Space Marines are tough cookies!) There is thus much talk about the creeds of the Ultramarine, many of which they get to test on the field of battle. That’s all well and good, but the phrase “Courage and Honour” was used at least two dozen times in the book. A few times would have been much les of a distraction. As might be guessed, squeaky clean Uriel proves himself to be worthy of his previous command. Just in time for the short and dramatic cliffhanger of the book’s final paragraphs. The final book in the trilogy, The Chapter’s Due, is by far the most epic of all the Ultramarines stories as it deals with attacks on the revered home worlds of the Ultramar system, home to the Ultramarines forces. The attack is made by M’kar, a demon with a long history that stems back to the days of The Horus Heresy timeline, but whose anger is more recently directed at Ultramarines Chapter Master Marneus Calgar for trapping him to the warp core of the star fort Indomitable. Although the official story was that he was destroyed, M’kar was indeed alive and ultimately freed by renegade Warsmith Honsou (who readers saw in Book 3, Dead Sky, Black Sun) to help lead his Iron Warrior forces against the Ultramarines since they share the same enemy. Honsou also has another trick up his sleeve: a clone of Ventris (called the Newborn) that was grown in Dead Sky, Black Sun but can now finally be put to use. Ok, got all that? Although it takes a while to wrap your head around the setup, the plot itself is pretty straightforward: Ultramarines trying to prevent the complete and utter destruction of the worlds of Ultramar by M’kar, Honsou and his Iron Warrior forces. Once the enemy reveals himself — with nothing less than the destruction of an entire planet– various Ultramarines chapters are called to arms. Chapter Master Marneus Calgar calls upon Captain Uriel Ventris since Honsou’s hatred is directed at him, but he sends for others, too, including Cato Sicarius (who also has a history with M’kar). It should be obvious that this is the book in which the author’s many other tendrils into the Warhammer 40K universe come together to create a story that has a great weight, even if you haven’t read all of the other stories. The epic nature of the story notwithstanding, this is still a Warhammer book and it delivers the expected action scenes almost nonstop. Like the previous novels, its use of superlatives was distracting. It’s one thing when a character from some chapter declares themselves to be the ultimate fighter, but when the omniscient narrator repeatedly declares that some warrior/chapter/enemy is the best warrior without equal, it just pulls you out of the story. The Chapter’s Due also suffers a bit from having too many secondary characters to keep track of. On the other hand, the alternating story lines lent themselves well to the scope that the story required. Missions take place across multiple planets, each one in themselves worthy of recognition. The action was fierce, the battles dramatic and many of the evil characters were ones you could easily root against. By the end of the final story, there is a genuine feeling of catharsis, as if you yourself had been fighting alongside the Ultramarines. Well, maybe watching from the sidelines.